The Merping Gwuntmump is a semi-aquatic organism that was originally sold as “Sea Babies” by the Blammo Novelty company in the back of comic books in the early 1960s. After it was learned just how large Gwuntmumps could grow and what disgusting habits they had, Blammo quickly replaced Gwuntmumps with brine shrimp, and so tiny brine shrimp are what most people think of when Sea Babies are mentioned. 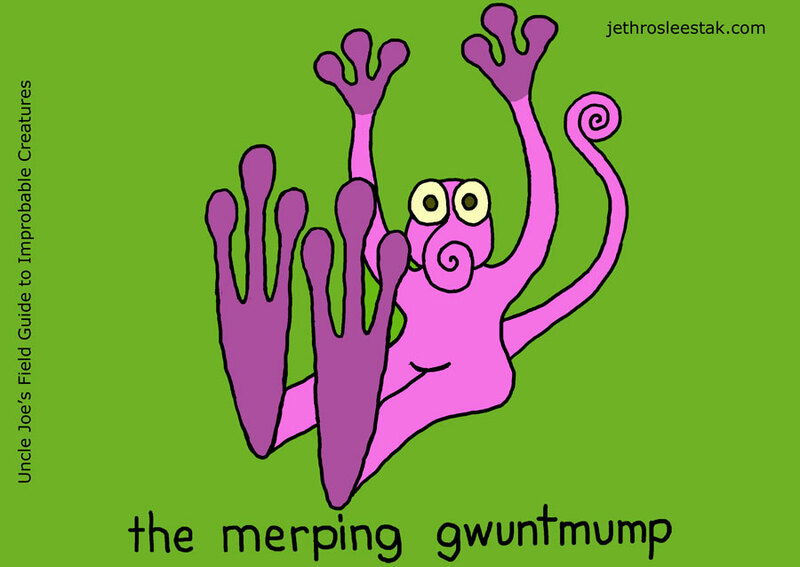 Just like brine shrimp, the Merping Gwuntmump is tiny when first hatched, but the Gwuntmump can grow to the size of a small human adult if fed an adequate diet and kept in a large enough aquarium. The Gwuntmump is particularly fond of cabbage, beans, peanuts, pickled eggs, and sauerkraut, and it will fastidiously avoid any food that does not contribute to its overwhelming non-stop flatulence. Scientists believe that the Gwuntmump uses its flatulence to attract bugs and other prey, but humans, dogs, cats, and most other higher mammals find the odor unbearable. The class-action lawsuit that convinced Blammo to replace the Gwuntmump argued that the Gwuntmump’s habits of climbing into bed with people and following people around were what made it particularly disgusting. I mean, it’s OK to smell like a dead cow rotting in a dumpster in July if you think you really have to, but do you have to come around me and do that? Buses, elevators, and other confined spaces.